I received this book last summer and have been waiting for the right time and mood to read it, for I knew it would be a powerful one. I was glad I waited until after the holidays when I had a few days to breathe and relax. This book took it out of me, both physically and emotionally. How can I compare my anguish in reading this story to Mira Bartok's living it? I can't. Mira Bartok spent seventeen years hoping that her mother, Norma Herr, would never find her. A severe case of schizophrenia caused Norma to obsess over her daughters' lives-calling them fifty times a day or more, appearing unannounced at their jobs and homes, threatening them if they suggested that she get treatment for her illness. After Norma violently attacked her daughters when they insisted she get help, Mira and her sister decided that they must change their names and cut off all contact in order to stay safe. During the next two decades, Mira traveled the world but she could not abandon her past. As Mira struggled to balance her alliance with her sister, her burgeoning art career, and her anguish over losing her mother she and Norma began exchanging letters through post office boxes. At age 40, a debilitating car accident leaves Mira with a terrible brain injury. She could retrain herself to draw and to write but struggled to regain memories. When she learns that her mother has been hospitalized with terminal cancer, Mira and her sister decide to visit Norma before it is too late. In those final weeks, they experience a cathartic reunion that none of them had imagined possible and Mira begins to reconnect with the memories the she feared had been lost. The power of reading a well written memoir is feeling like you have been hit by a truck after its done. Though I love memoirs and appreciate the honesty that comes along with sharing your own story, I find it unnerving when I walk away changed. On one hand it's a testament to the talent of the storyteller, on the other it's the tragedy of the story itself that makes you look at your own life differently. Mira Bartok, in my opinion, has a lot of guts for sharing her story. Schizophrenia is a terrifying disease and not one that should be candy coated. She tells it with brutal honesty how her mother was enveloped by this but at the same time, her love for her is still so powerfully present. I was excruciatingly uncomfortable while reading certain parts of this book especially during her mother's manic, tragic moments; the ranting, the accusations, the threats, the violence. I was also deeply saddened by the sheer neglect of these two little girls during their childhood. Mira's Grandparents, though close (down the road), are still absent in their own way; the Grandfather, an abusive alcoholic; the Grandmother, a submissive woman just wanting some peace. Sure, they were fed and given a place to sleep but nurturing was not something they receive enough of. I admire Mira for forging on through her adult life and making the brave decision to cut all ties with her mother. One thing I have learned for working in social services with children is no matter how horrible your home life is, it is still your home and you will always feel attached to it. I can only imagine the guilt and sadness she must have felt all those years away from her mother and her connection to her home. The story does take different twists while Mira explores the world in her art career and during those parts, her mother is still present but not as vibrant and intense. It was a nice break as a reader and I don't mean that in a negative way. It was simply too emotional to read page after page of her mother's trials and it was refreshing to see Mira find some peace in her own corners of the world. 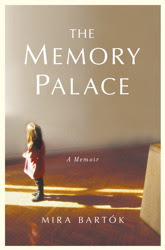 This was a profound memoir, almost a little difficult to review. The power was overwhelming and I honestly don't feel my words could do it justice. It is certainly a journey, one that doesn't get neatly wrapped up in the end. The story is filled with many lifetimes and Mira Bartok does a fantastic job in the details. All I can do is say thank you for sharing your heart wrenching story with all of us and I hope more can learn from it. Ricci, a jesuit priest who possessed great mnemonic powers, traveled to China in 1596 and taught scholars how to build an imaginary palace to keep their memories safe. He told them that the size of the palace would depend on how much they wanted to remember. To every thing they wanted to recall, they were to affix an image; to every image, a position inside a room in their mind. If memory is a palace, let me live there, forever with her, somewhere in that place between sleep and morning. Without her long nights waiting in the rain, without the weight of guilt I bear when I buy a new pair of shoes. Let me dream a palace in the clear night sky, something between Perseus the Hero, and Cygnus, the Swan- a dark comforting place. A place lit by stars and a winter moon. Yes, though it may be intense for some, I feel it would generate a lot of discussion. Topics like Mental Health, Familial Obligation, Art, Domestic Abuse, Substance Abuse are heavily present in this book. Did I know you had worked for social services before? I don't remember! gritty and honest book..wow pretty cover. Wow. Great review. I love when you said: "The power of reading a well written memoir is feeling like you have been hit by a truck after its done. " Ooh...I like the starkness of the cover art there. Very well said on the power of memoirs. I really didn't get into them until last year or so....oh what a world of change and realizations I was missing. Wonderfully written review. These are certainly hard to "judge" since they are a person's life but you did it very well. Have a great weekend...and happy reading! I like books that hit you hard and change your perception a bit...sounds gritty, realistic, and one that deserves to be read! I hadn't heard of this one but I'm definitely going to have to pick it up. I'm glad to know that I'll need to be in the right frame of mind when I read it. This sounds like an excellent book. Great review! This just arrive from Sounds. Sounds powerful and a tough subject. I just received this one in the mail yesterday. You have confirmed my first impressions of the story. I immediately thought it was going to be a very powerful story. I hope to get to it soon. This memoir sounds very powerful. I work as a teacher and I see time and time again that no matter how awful a home environment will be, children are attached to it. The book sounds really intense. I have added it to my TBR! This book sounds fascinating. Thank you for the awesome review! On my way home from work tonight I was listening to an NPR story on Fresh Air about this book. They were interviewing the author. Here is the link if you are interested.